On Saturday I bid adieu to Seattle’s iconic Alaskan Way Viaduct, along with the Battery Street Tunnel. Both of them were not considered up to current seismic standards, and are being replaced by the new State Road 99 Tunnel, which is scheduled to open today. Read more about it here. It turns out that I wasn’t alone in wanting to say goodbye. It’s estimated that 100,000 other people walked the tunnel and viaduct this weekend. I’m sure many of them felt a lot more nostalgic than this relative newcomer did. The viaduct had been around since the 50’s, after all. I was enjoying taking in the view for the last time, and marveling over the massive construction project. I had also expected a different kind of celebration. I was disappointed. I was expecting food trucks and vendors and souvenirs. There were more port-a-potties than there were food trucks, and there wasn’t a single souvenir to be had. There were a few musicians here and there, and a smattering of antique cars. That’s about it. I did enjoy checking out the graffiti in the tunnel. I think the city missed a great historic opportunity there. The tunnel is eventually going to be filled in with the debris from the viaduct and sealed off. They should have handed out sharpies and allowed people to write on the walls. Imagine what a treasure trove that would have been 500 years from now, what a time capsule, if we humans have managed not to completely destroy life as we know it. Archeologists would have been fascinated with what we found important enough to say, one day in time, back in 2019. So while others were feeling nostalgic, I was feeling kind of sad at historic opportunities missed. And then I ran into a coworker. He was standing mid-tunnel, next to the office door. That’s a room most people don’t even know exists. I certainly had no idea. So he let us peek inside. How many people have come and gone in that office over the years? I wonder. I felt privileged to get a glimpse of this lonely little room. But even better, my coworker had a sharpie. And I took advantage of it. So, if you are reading my humble little blog post 500 years from now, first of all, nice to meet you. Second of all, if you’re excavating the Battery Street Tunnel, just outside the office door, you might still be able to see my graffiti. 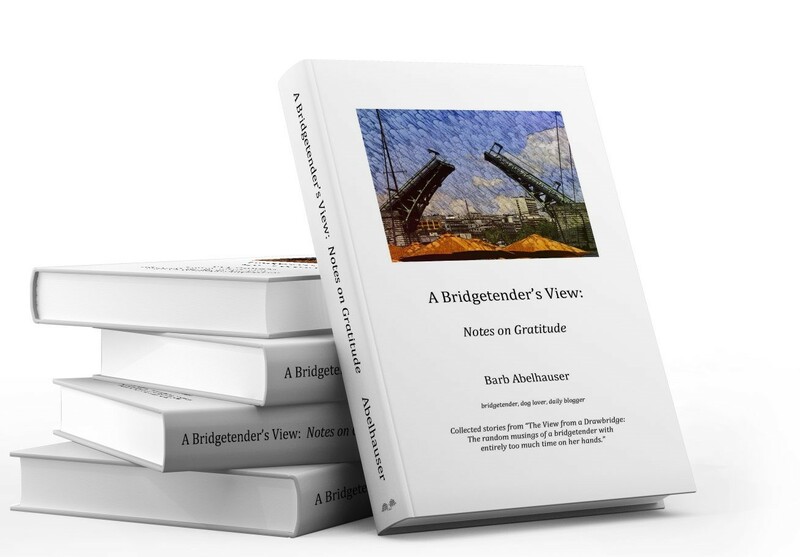 “Barb Abelhauser, Bridgetender, 2019”. That was me. I was there. In that tunnel. Saying goodbye. Here are some pictures from the experience. I hope that you can get your dreams reconciled with your CPAP. It seems there is a lot of sleep apnea going around. Me, I wonder why they haven’t got the surgery figured out yet that’d make those machines not necessary. I don’t condone graffiti either. My bridge gets a lot of it. But this is about to get buried, and it’s history, so I made an exception. And yes, I’m so enjoying the silence. And my dogs are enjoying the zoomies. I do love magical mystery doors. MY doc says the surgery they do these days is a monumental waste of time. From what I understand, there’s a lot of doctors out there who are more interested in growing hair on cue balls, inflating starlets, mutilating baby boys, shilling for drug companies, and blaming the rest of us for our weight, than actually doing anything helpful. Of course they aren’t all like that by any means, but I have run into a few, and heard of more. If I go any farther into this I will just get mad. Enjoy the snow.